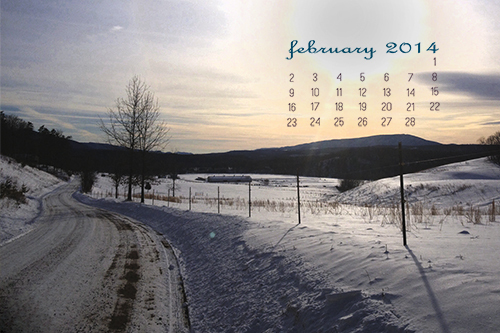 To download the image above to use as your desktop wallpaper, simply click the image (or this link: February 2014 Desktop Calendar) and choose Save Link As… Then, open the picture, right click and choose Set as desktop background. I was sure when I made the announcement at the beginning of the New Year about Life Your Way’s new direction that the new site would be up within a couple weeks. And yet here we are turning the calendar to a new month…and still no new site! With my realization that I’m dealing with a bit of postpartum depression and my commitment to really living in 2014, it’s been a slow process, but I am still plugging away on the new site. My plan at this point is to take a break from posting the week of February 17th so that I can finalize the design and the transfer. I am so excited to show it to you and I’m afraid I’ll never get it done without clearing my schedule! I also gave the girls the two weeks of the Olympics off from regular school (I’ll prepare a few Olympic unit study activities for them ahead of time!) so hopefully I’ll have plenty of time to focus on getting the site done. Even though the new site isn’t up, I’m enjoying the new, slower pace of Life Your Way and getting back to things like printables and organizing, quick tips and sharing stories from my own life. As usual, my brainstorming pages are overflowing with things I would love to do in 2014 — ebooks I want to write, courses I want to release, new features on the site, etc. — but I think learning to slow down and only choose the best during this season will be good for me. I hope you’ll stick around to see what we have in store, though! Again, thank you for being part of the Life Your Way community and for taking the time to comment on posts, send me emails and share the site with your friends and family — I wouldn’t want to do any of this without you! Mandi Ehman is the blogger behind Life Your Way. She and her husband have four beautiful girls plus one baby boy, and together, they live, work and homeschool on a little slice of heaven in wild, wonderful West Virginia. She loves coffee, chocolate, easy meals, beautiful things and minimalist spaces. Get It On with Genesis Today’s Cranberry Goji and Win $2000!